Both teams' coaches figured out the perfect way to describe the boys basketball battle that went down Tuesday night. FISHERTOWN - Both teams' coaches figured out the perfect way to describe the boys basketball battle that went down at Chestnut Ridge on Tuesday night. "I told the guys before the game, it's going to be like a classic boxing match," Shanksville coach Robert Snyder said, "and it's not going to be a knockout punch. It's going to go 12 rounds." Southern Fulton coach Kent Hendershot said, "I told my assistant coaches after the game that it was like we fought (Mike) Tyson. It just seemed like when you thought one was finally going to fall down and give in, they rose back up. It was like a Rocky movie." It was certainly a slugfest, and it took two overtimes before Southern Fulton had its hands raised as the victor. 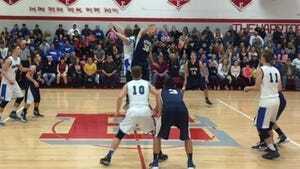 The Indians avenged last year's championship loss, defeating the Vikings 64-58 in a District 5 Class A semifinal. "I'm not really sure how we won that game, to be honest," Hendershot said. "I kept telling my guys that we need three plays - two defensive stops and one with good offense. Once we got a cushion, I knew we could win the game." The victory sets up an all-Fulton County District 5 championship. No. 2-seeded SF (20-5) will face No. 1 McConnellsburg (21-3), which was a 40-26 winner over Shade. Shanksville (22-2) did a nice job early of holding down SF's top scorers, Dylan Gordon and Trent Rider, who combined for just 10 points in the first half. But the pair were the biggest difference makers in the final overtime. "(Coach) gave us a speech about how hard we worked in the gym all season," Gordon said. "He didn't want us to throw it away on basically one play that we would remember for a long time. He told us to do all the things we know how to do; we just had to execute." Southern Fulton got the first basket of the second overtime with a layup from Zach Clark, and when the Vikings missed a 3-pointer, Trent Rider made them pay with another layup to give the Indians a 58-54 lead. "At that point, I was able to go into a zone trap a little bit and throw them on their heels," Hendershot said. "I thought it worked. We got stops with good offensive possessions, and it finally came together for us." Gordon all but sealed the victory with a pair of free throws to make it a six-point lead, but Shanksville still didn't let up. Joe Hudak, who led the Vikings with 16 points, drained a timely 3-pointer. Shanksville then watched the momentum quickly slip away when Rider went 2-for-2 from the line to once again make it a two-possession game with less than a minute to go. "That was the first game we battled back and actually won," Gordon said. "All five games we lost, we got close but we never got over the hump." With Gordon sitting on the bench for the first five minutes of the fourth quarter in foul trouble, Southern Fulton desperately needed one of its role players to contribute. And Carl Potter did just that. He scored seven of his 10 points in the fourth quarter, and after going 1-for-5 from the floor to start the game, he was 2-for-2 in the fourth and 3-for-3 from the line. "I was starting to feel it in the fourth," Potter said. "I wasn't shooting particularly well to start, but then I started to pick it up a little bit. Dylan was in foul trouble, so I gave my team a little bit of a boost going into OT." Snyder said, "I think we gave (Potter) a lot of seams to the basket, and of course our two keys were Dylan and Rider. Unfortunately for us, when (Potter) had good shots, he made them, and we didn't do that." NOTES: Rider led all players with 21 points, despite having just four in the first half ... Gordon finished the game's only double-double with 14 points and 10 rebounds .. Potter stuffed the stat sheet with 10 points, seven rebounds, four assists and three steals ... Dawson Snyder was the only other Shanksville player to finish in double figures; he had 15 points to go along with four steals. Joe Hudak 5 2-3 16, Jesse Bittner 3 2-2 8, Will Bryant 1 2-2 4, Dawson Snyder 5 4-8 15, Adam Struky 0 0-0 0, Aaron Smith 3 3-3 9, Baily Blackburn 2 0-0 5, TJ Coughenour 0 0-0 0, Bryan Caton 0 0-0 0. Totals — 19 13-18 58. Carl Potter 3 3-3 10, Trent Rider 9 3-5 21, Branden Lynch 3 1-2 7, Zach Clark 3 0-0 8, Dylan Gordon 5 4-5 14, Owen Hawkins 1 2-2 4, Logan Beatty 0 0-0 0, Chase Varner 0 0-0 0. Totals — 24 13-17 64. 3-point goals — Shanks 5 (Hudak 2, Snyder 2, Blackburn), SF 3 (Clark 2, Potter).